Another building, adjacent to the collapsed building of Ruby Residency, has also started collapsing. As a result, the rescue work has been stopped by the authorities. There is nobody staying in this building as it was also under construction. 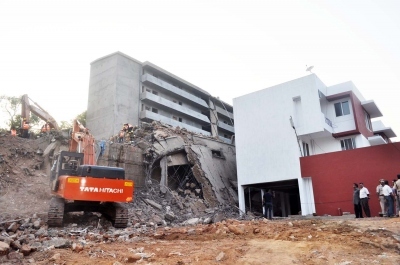 South Goa collector Venecio Furtado told goanews.com that the painted building adjacent to the collapsed building has started tilting. “We could even notice major cracks developed in the building. The rescue work has thus been stopped”, he said. One house, which is close to this building, has also been evacuated, said Furtado. Even electricity to the whole area has been cut off, as a safety measure. It is a block of four buildings, even having a common staircase, one building of which had collapsed on 4 January, causing major mishap. The adjacent buildings had developed cracks, but the rescue teams had continued its work pulling out people even alive, taking risk. Realising the danger of adjacent buildings collapsing, the authorities had yesterday evening had stopped the work for a while, but then decided to resume it at night. However, Furtado said they had no other option than to stop the rescue work since one building has started tilting. The rescue teams had succeeded in pulling out 45 workers trapped inside, including 17 dead bodies. The authorities have also managed to get information about 10 more workers trapped inside while few more may also be trapped. TCP ,Town Planner ,Civil Engineer , Builder/developer &Contractor must be brought to justice and give penalties and fines with imprisonment. Compensation for the dead is not solving problem for the deceased families.